There’s no denying the fact that in the recent months, denim has been receiving major love. This spring-summer particularly, we have been seeing denim being spruced up like never before. Remember Sonam Kapoor’s ripped denim saree or Kareena Kapoor’s denim pantsuit that these stars wore during the promotions of Veere di Wedding? That was definitely not all. 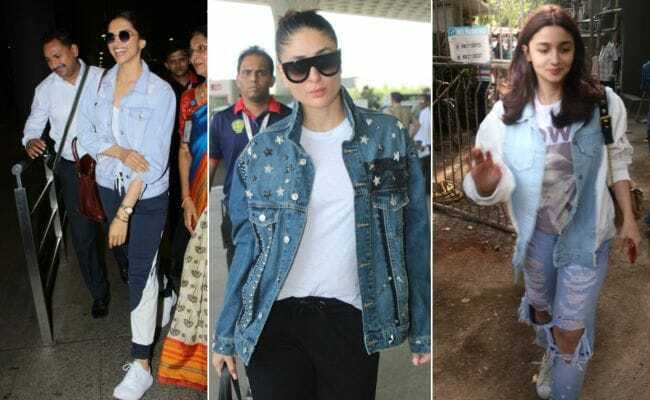 From flared jeans and high-waisted skirts to distressed pants and denim dresses, Bollywood divas have all been making trendsetting style statements in all-time favourite denim. In this craze for denim, another style that has been popular with celebs to add a chic spin to everyday casuals is denim jacket. Come summer or winter, looks like there’s no getting away from denim jackets. And with so many trendy styles making their way to celebrity style wardrobe, it’s little wonder why denim jackets have become such a rage. So if you love denim, and want to spruce up your style game, you definitely need to get hold of a few stylish denim jackets. Let’s start with the classic. This one is a must because hey, classics are forever. You can go for a clean look or pick ones that are faded or slightly ripped. Deepika Padukone recently made a chic style statement in a trendy denim jacket. A perfect way to beat the heat, oversized or boyfriend denim jackets are perfect to team with summer dresses or tees. If there’s one celeb who has been acing this look, it is Rhea Kapoor. Denim trench coat looks chic, can be teamed with many styles, and is all about comfort. If your style statement is all about being edgy, then you definitely need an embellished denim jacket. From studs and spikes to beads and applique, there are many trendy styles. What makes biker style jackets a hot favourite is the sleek cut. You can team it with trousers and even dresses. Manushi Chhillar looks on point in her biker jacket look. Like Hina Khan, you too can spruce up everyday casuals instantly by wearing a cropped denim jacket. Or ace the denim on denim trend like Kareena Kapoor while showing off your toned midriff. Not too found of monochrome? Add a fun twist to your casual style with two-toned denim jacket like Alia Bhatt. Or if you love colours a bit too much, go from a multi-coloured denim jacket like Pooja Hegde. Join in the denim trend and have a blast this season with stylish denim jackets.